SPACES FOR CHANGE joined 50 other non-profit stakeholders in West Africa at the three-day regional workshop organized by the Intergovernmental Action Group against Money Laundering in West Africa (GIABA) to discuss the strategies for developing effective frameworks and structures to fight money laundering and terrorist financing through non-profit organizations (NPOs). 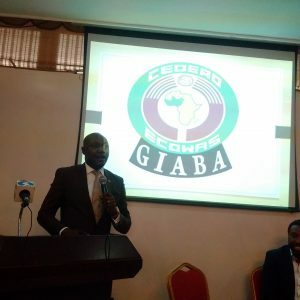 GIABA, the institution responsible for coordinating anti-money laundering (AML) and counter financing of terrorism (CFT) in the West African region, brought together both practitioners, policymakers and regulators of the non-profit sector from ECOWAS- member countries at the workshop held in Abuja from the 4th to 6th of April 2018. Both the welcome address by the Director of Nigerian Financial Intelligence Unit, Mr. Francis Usani and the goodwill message by GIABA’s Director General, Mr. Kimelabalou Aba, reiterated Nigeria’s commitment to implement legislative and regulatory measures that ensure NPOs are not used for the purpose of financing terrorists. In line with this commitment, the event aimed to create a platform for in-depth reflection on best practices; to establish consensus; encourage cooperation and collaboration in order to prevent the financial abuse of NPOs. Criminalizing the proliferation of arms, money laundering and adopting confiscationary measures. Establishing preventive measures for national financial institutions and designated sectors to abide by. Establishing powers, measures, responsibilities for regulatory and law enforcement authorities to receive and analyze suspicious transactions. Boost the transparency and beneficial ownership information of legal persons and arrangement to prevent the use of legal persons for money laundering. Facilitate international cooperation by establishing international channels, mechanisms and bi-multilateral agreements that facilitate communication and effective transmission of requests and information. The presentations on the second day of the workshop featured an array of strategies for preventing and protecting the NPO sector from money laundering and terrorism financing abuse. FATF’s Recommendation 8 (R8) provides a guideline for countries to evaluate NPOs. Given the vital role NPOs play in the world economy and social systems, FATF recognizes their importance in providing services and assistance to those in need. Working in difficult contexts coupled with financial constraints could sometimes, make them soft targets for terrorist funding. On the other hand, terrorists may create sham charities to pose as legitimate entities and even infiltrate NPOs to perpetuate terrorist activities. Countries are therefore required to apply, without prejudice, a risk-based approach (RBA) when dealing with identified threats of money laundering or terrorist financing abuse in NPOs and also develop focused measures to protect nonprofit organizations from such abuse. Although FATF’s risk-based approach (RBA) recognizes the diversity of civil societies and the fact that not all NPOs are exposed to the threat of financing abuse, some countries have latched on to the obligation to develop AML and CFT measures to introduce restrictive and disruptive mechanisms that interfere with the legitimate operations of civil society organizations, resulting in the shrinking of civic space. An effective RBA allows legitimate civil societies to develop and applies measures proportionate to the identified risks. These measures must promote accountability, enhance trust among NPOs, beneficiaries and legitimate donors. Participants also learned about the mutual evaluation reports prepared by GIABA. The presentation by Fulco Van Deventer, an Associate Fellow at the International Centre for Counter-Terrorism (ICCT) and Co-founder and Deputy Director of the Human Security Collective (HSC) compared the different methodologies of applying the RBA to NPOs across countries. The FATF conducts peer reviews of each member periodically to assess levels of implementation of the Recommendations. The assessment typically provides a critical description and analysis of each country’s system for preventing abuse of the financial system. It is expected of countries to harness their resources effectively to install proactive systems and preventive measures that are commensurate to the nature of risks that they face. On the third day of the workshop, presenters underscored the importance of adopting a legal and regulatory framework for AML/CFT supervision of non-profit organizations in Nigeria. The Special Control Unit on Money Laundering (SCUML) is a self-regulatory body established by the Federal Government of Nigeria in compliance with the provisions of Money Laundering (Prohibition) Act 2004. The body carries out the statutory role of monitoring, supervising and regulating the activities of designated Non-financial institutions (DNFIs) in Nigeria. Educating participants on the statutory arrangements for regulating the activities of DNFIs, Bamanga Bello, Director of Special Control Unit on Money Laundering (SCUML) highlighted a number of statutes and applicable provisions aimed at combating money laundering. For instance, the Money Laundering (Prohibition) Act, 2011 (as amended), imposes limits on making or accepting cash payments above five million Naira for individuals and ten million for corporate organizations except in a transaction through a financial institution. In general, the results of this workshop support the idea that all hands must be on deck to combat AML and CFT in Nigeria. In this regards, self-regulatory bodies, including NPOs, can promote AML/CFT compliance by enforcing rules that ensure a high ethical and moral standard in the sector. In doing this, NPOs have an important role to play in both facilitating the generation of new solutions and implementing measures to check abuse within their organizations.